Not that long ago, customers looking for an affordable electric vehicle had basically one option: the Nissan Leaf. 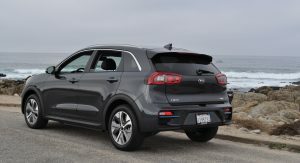 Since then, the segment has grown to include competitors such as the Chevrolet Bolt, Hyundai Kona Electric and Kia Soul EV. 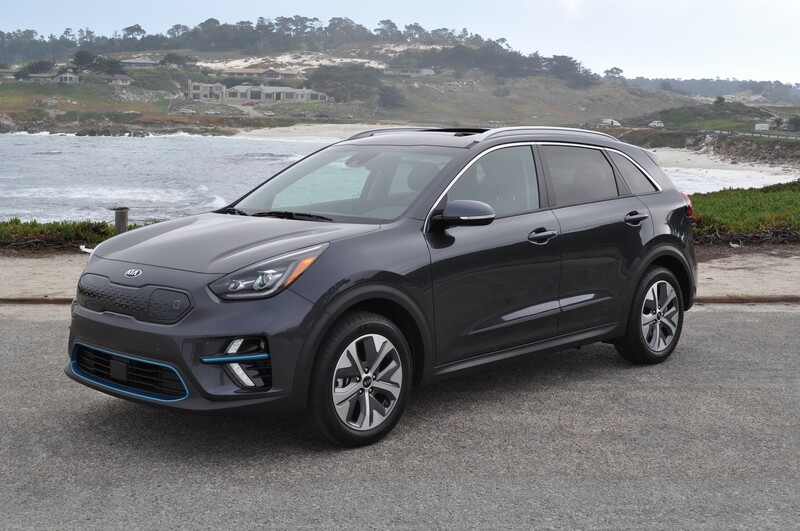 The latest arrival also comes from Kia and it’s the 2019 Niro EV. 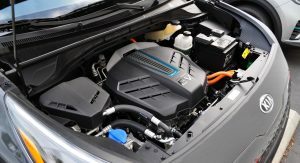 Billed as a fun and affordable electric crossover, it is the third member of the Niro family which also includes the standard hybrid and plug-in hybrid variant. 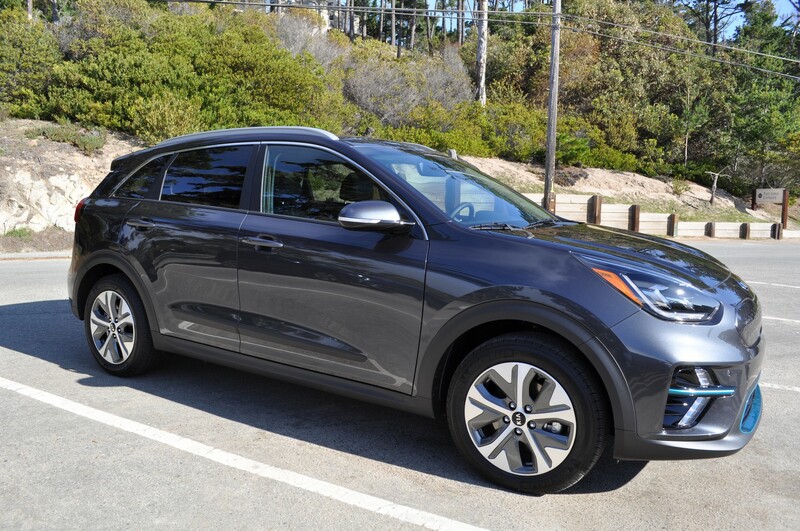 We recently traveled to California to test out the car and came away pretty impressed. 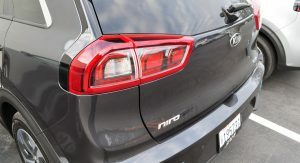 While the electric variant is new for 2019, the Niro has been around for a couple of years. 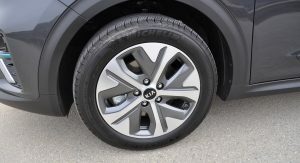 As a result, its styling is instantly recognizable. 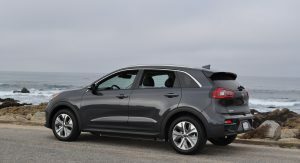 That being said, the Niro EV is distinguished by a handful of unique styling touches. Starting up front, the model has a sporty fascia with a fully enclosed grille as there’s no internal combustion engine to cool. 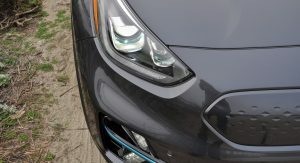 Further below are distinctive “Arrowhead” LED daytime running lights and blue accents. 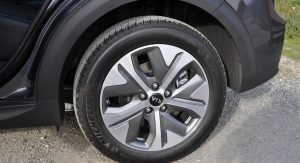 Additional changes include new rocker panels, a revised rear bumper and aerodynamically optimized 17-inch alloy wheels. 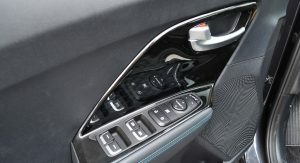 The unique styling continues in the cabin, where there are a handful of items that are exclusive to the Niro EV, like a rotary shifter, a custom center console and “Eco Electric” badging. 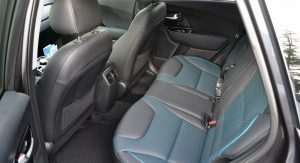 Customers will also find two-tone upholstery and special trim. 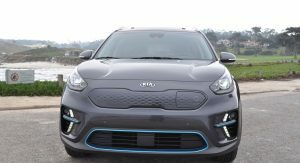 The Niro EV will be available in two trim levels. 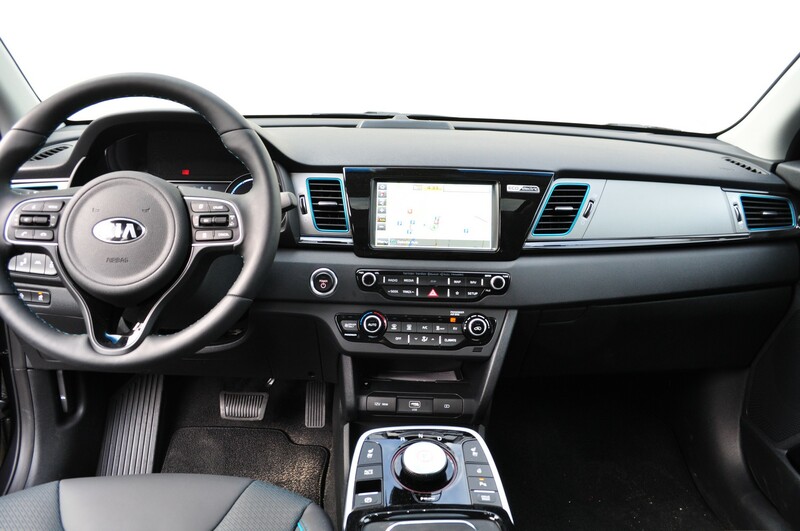 The entry-level EX comes nicely equipped with a leather-wrapped steering wheel, an automatic climate control system and a 7-inch infotainment system with Android Auto and Apple CarPlay compatibility. 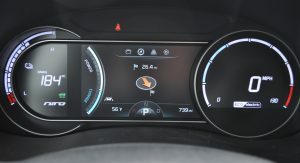 Other highlights include cloth / artificial leather upholstery and a 7-inch TFT display in the instrument cluster. 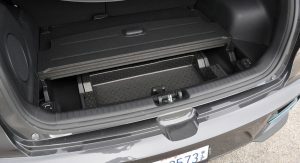 Rounding out the highlights are power windows / locks, a split-folding rear seat and a four-speaker audio system. 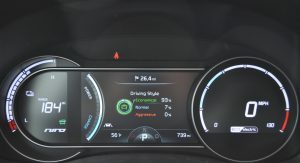 Despite its entry-level status, the Niro EV EX comes with an assortment of driver assistance systems. 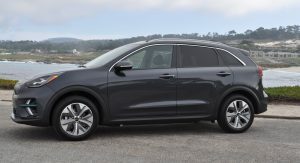 These include blind spot collision warning, rear cross traffic collision warning, lane keep assist, lane following assist and a rear-view camera with dynamic guidelines. 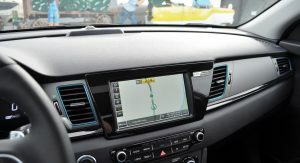 Drivers will also find forward collision warning, forward collision-avoidance assist and smart cruise control with stop and go. 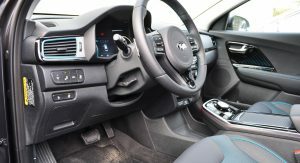 We drove the range-topping EX Premium which adds additional luxury features such as heated / ventilated front seats, a power sunroof and a 10-way power driver’s seat. 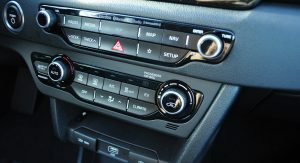 The model also boasts a wireless smartphone charger, Niro-branded scuff plates and LED interior lighting. 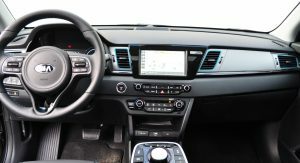 On the tech front, there’s an 8-inch infotainment system with GPS navigation as well as an 8-speaker Harman Kardon premium audio system with a subwoofer. 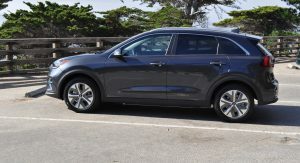 In the top of the line spec, the Niro EV is a comfortable cruiser that provides plenty of room for up to four adults. 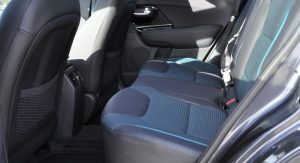 Both front seats are comfortable and spacious with supportive bolstering. 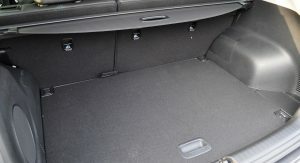 The front seats also offer plenty of head and legroom, even in the EX Premium that has a standard sunroof. 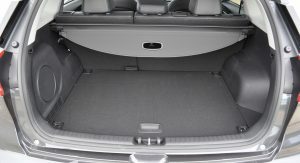 The rear seats aren’t quite as comfortable, but they still offer a decent amount of head- and legroom – providing front passengers play ball. 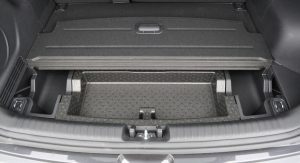 Speaking of the back, the Niro EV has a generous cargo compartment which can hold up to 53.0 cubic feet (1,500 liters) of luggage with the rear seats folded. On the downside, some materials aren’t exactly top notch. Most of the plastics are of a decent quality, but they don’t match the levels of Toyota and Honda products. This can best be seen in the sun visors which are constructed out of incredibly cheap and hard plastic. 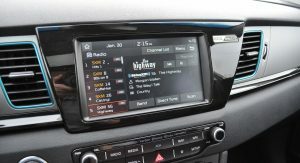 And while the sun visors are a minor grip, the infotainment system isn’t. While it works fine, the design of the system and its graphics feel a bit dated. 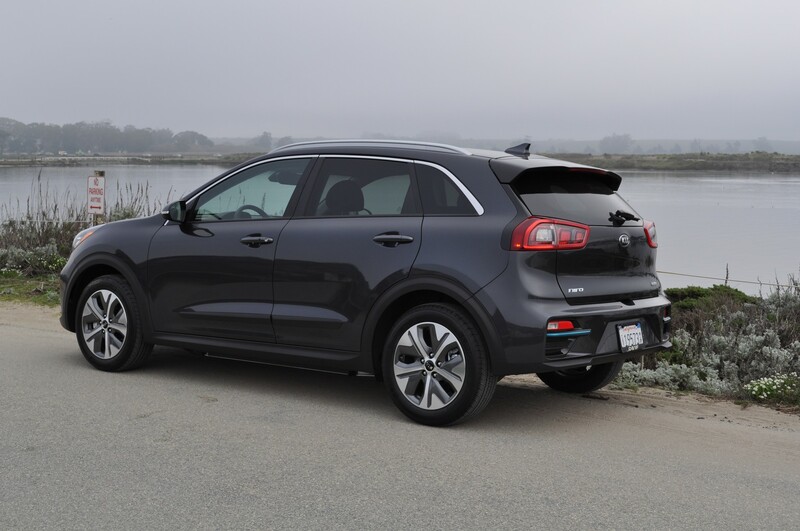 This shouldn’t be too surprising as the Niro itself is a few years old. Despite these small issues, the cabin is a nice place to spend some time. 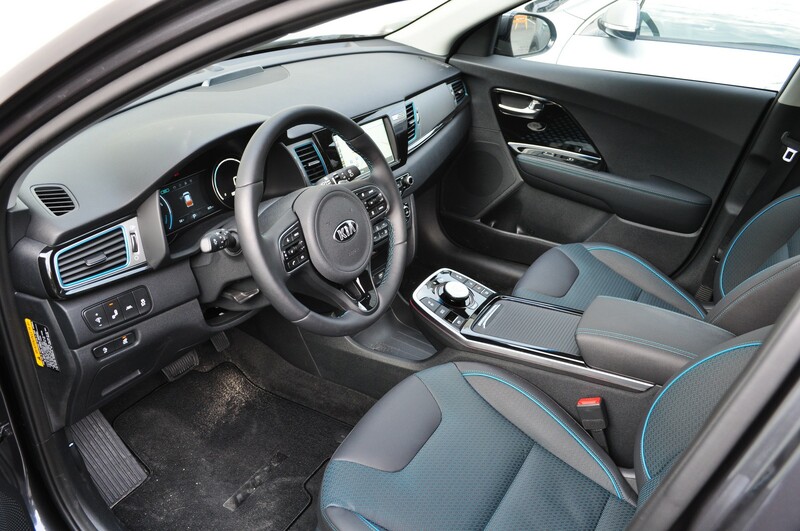 The Niro features an excellent leather-wrapped steering wheel with perfectly placed thumb indentations. 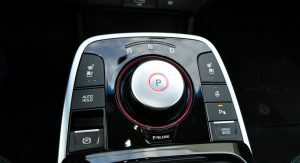 The overall design of the cabin is also eye pleasing and the unique shifter is relatively intuitive after a while. 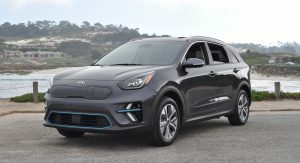 Despite being billed a crossover, the Niro EV is available exclusively with a 201 hp (150 kW / 203 PS) electric motor that powers the front wheels only. 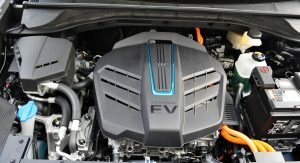 While this won’t appease fans looking for an all-wheel drive SUV, the motor does produce a healthy 291 lb-ft (395 Nm) of torque. 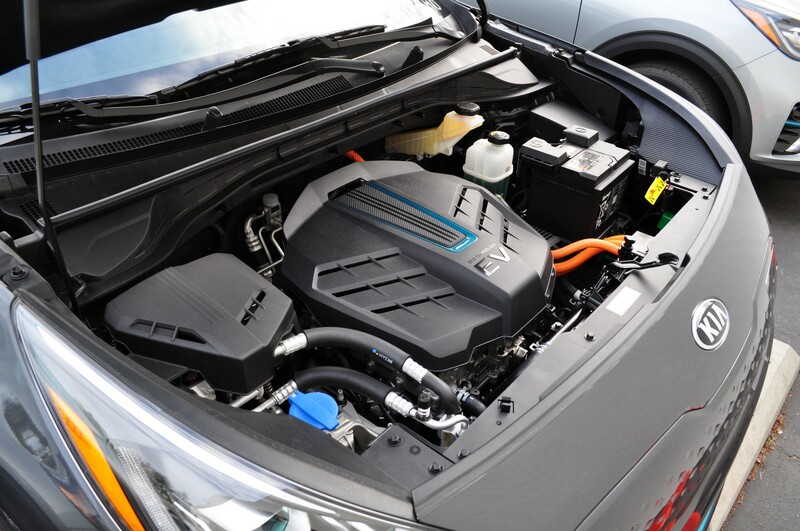 The electric motor is feed by a sizeable, 64 kWh lithium-ion battery that weighs 1,008 lbs (457 kg). 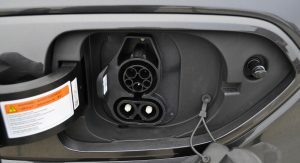 This setup enables the model to travel approximately 239 miles (384 km) on a single charge. 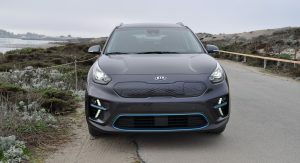 Kia’s particularly proud of the Niro’s range and said it should be enough to last most owners three to four days without needing a recharge. That will depend on your usage and people like myself, who are mostly telecommuting, could probably manage a week or more. 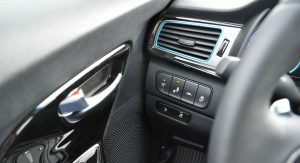 When it does come time to recharge the Niro, owners will be happy that designers installed the charging port in the grille where it is easy to access. 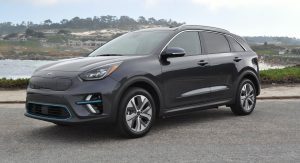 That’s a good design decision, but Kia estimates the recharging process will take an incredible 59 hours with Level 1 charger and a 120 volt outlet. That’s nearly two and a half days, and is probably due to the high capacity battery, but in practice this method will be used only as a last resort. 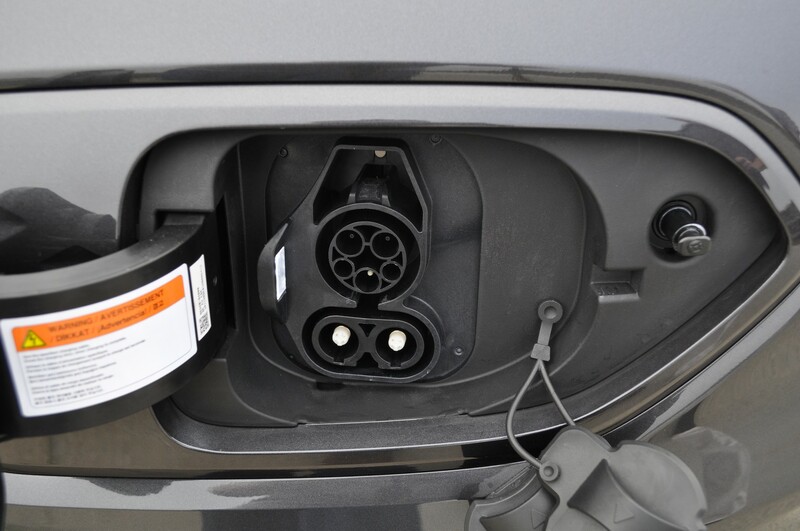 Instead, most owners will likely use a 7.2 kW Level 2 DC fast charger that reduces the time to 9 hours and 35 minutes. 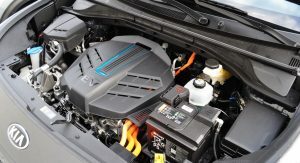 Owners needing a faster option can use a more powerful DC fast charger rated at 50 kW or 100 kW, with which the Niro EV can get an 80% charge in as little as one hour. 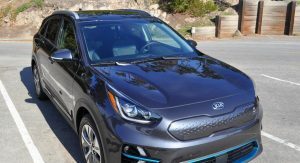 In terms of performance, the all-electric Niro can accelerate from 0-62 mph (0-100 km/h) in 7.8 seconds before hitting a top speed of nearly 104 mph (167 km/h). While those numbers doesn’t sound that impressive, the car is pretty nimble and fast for something that weighs a rather hefty 3,854 lbs (1,748 kg). 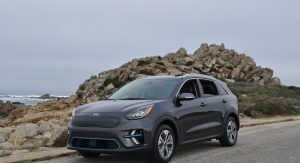 While we don’t necessarily view the Niro EV as a crossover, this plays dividends in terms of dynamics, where it offers a comfortable ride and handling more on par with a normal hatchback. 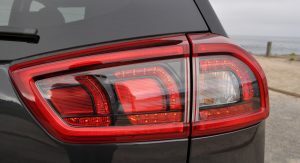 This means drivers can expect a tight turning circle, good road handling and the ability to dart in and out of traffic. 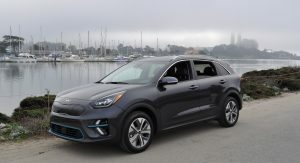 Throwing the Niro into a curve at speed is a surprisingly rewarding experience and the instant torque of the electric motor belies its somewhat less than impressive 0-62 mph (0-100 km/h) time. The brakes are also pretty good, but we didn’t have a chance to really put them to the test during our journey in and around Santa Cruz. 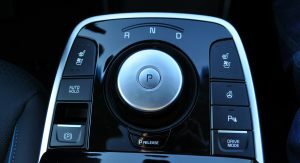 The steering has a natural feel and the lane keep assist systems works well on the highway. Given the electric powertrain, the model is also pretty quiet on smooth roads. 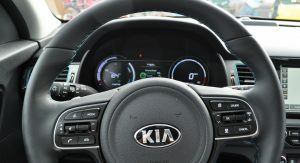 It’s actually so quiet that Kia installed a pedestrian warning system which uses a speaker behind the front bumper to produce a “fantastic techy whirring noise” when the car is being driven at low speeds. It’s a non-offense noise that can barely be heard in the cabin unless you’re really looking for it. 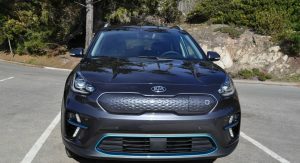 While the Niro EV has a lot going for it, only a handful of customers will actually be able to purchase one. 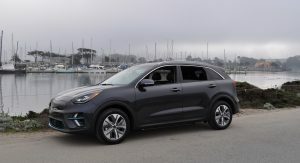 Kia plans to offer to the model in just 12 states, namely California, Connecticut, Georgia, Hawaii, Maryland, Massachusetts, Rhode Island, New Jersey, New York, Oregon, Texas and Washington. 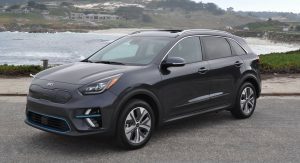 The automaker will monitor demand in other states, but there are currently no plans to offer the Niro EV nationwide as it is “capacity constrained.” That’s a bit disappointing, but the 12 aforementioned states would probably be responsible for the vast majority of sales anyways. 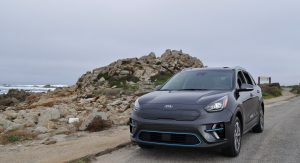 Kia wasn’t ready to talk about pricing, but confirmed the Niro EV will go on sale in the United States in mid- to late February. 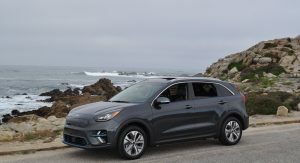 We can expect detailed pricing to be announced ahead of launch, but they hinted that it will be priced similarly to the Hyundai Kona Electric which starts at $36,450 before the federal tax credit of $7,500 and any state or local incentives. 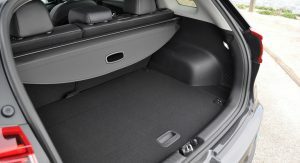 The Niro EV enters an increasingly competitive segment, but offers a good combination of comfort, technology and space. 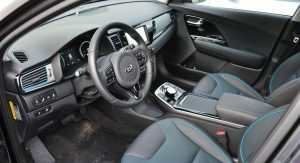 Throw in good driving dynamics and an impressive range of 239 miles (384 km), and it’s clear drivers looking for an affordable electric vehicle should definitely consider Kia’s latest offering. 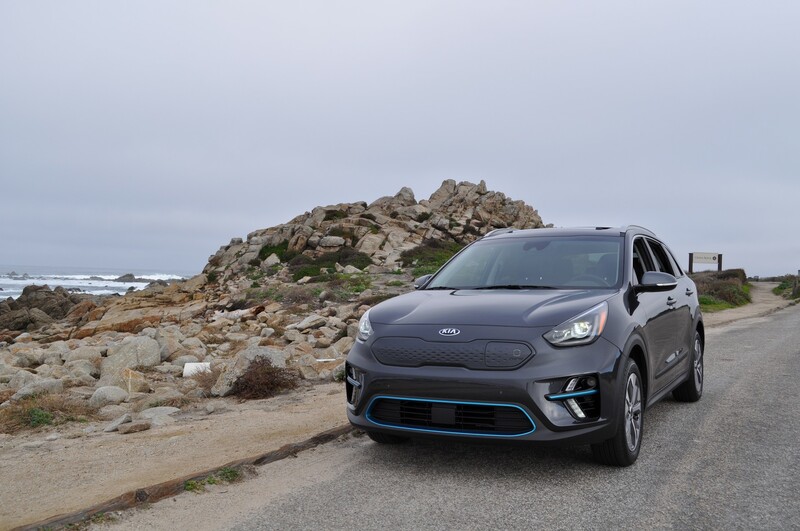 While it is definitely worth your consideration, drivers should also check out the Hyundai Kona Electric and the 2020 Kia Soul EV. 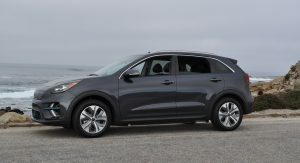 All three models share a similar powertrain, but the Kona is bit newer and offers a slightly longer range. 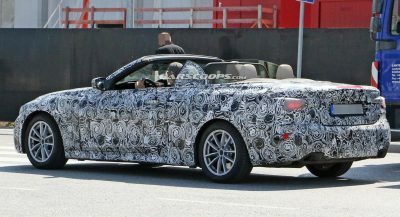 The Soul is all new, but its range is still unconfirmed. At the end of the day, more choice is good news for consumers. 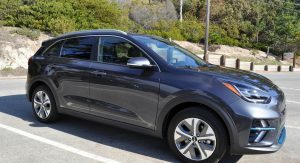 With three electric vehicles, Hyundai and Kia are positioning themselves as leaders in this particular segment and it will be interesting to see if they can hold that position given the onslaught on EVs coming from the likes of General Motors and Volkswagen. Gauthier apparently hasn’t seen the plastics in something like the Yaris or CH-R. 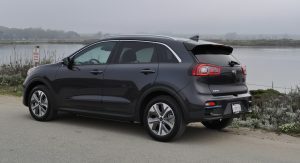 The Niro slots underneath the Sportage (which is pretty nice inside for its segment) and not surprisingly more of the development $$ was spent on the pricey alternative powertrain (same reason why the interiors of Teslas are lacking compared to their ICE competition).